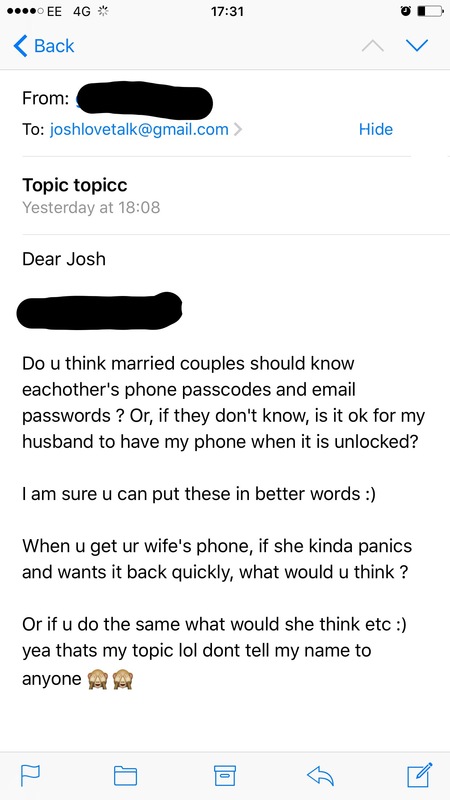 Following my last post, a reader emailed me asking for my thoughts on whether partners or married couples should share phone passcode or email password with each other. Thankfully my wife and I are now at a level where we know each other’s phone passcodes and email passwords, and we are comfortable giving that access to each other. That said, it didn’t happen for us overnight, we had our challenges along the way. At the beginning of our relationship, we had several arguments over phone access. For me it was an expectation thing; relationships should be about sharing and openness, and I could not get my head round why she would not want to share her phone passcode with me. For her it was a case of this is my space and I don’t have to share my details if I didn’t want to. That incident made me question my motive. My issue was not necessarily trust, although that was how it came across. Rather it was expectation that was not being met; based on my idea of what the qualities of a good relationship are – openness, sharing and being a team. I expected something like sharing phon­­e access to come as part of the relationship. My problem was that I wanted that immediately, and that’s common for a lot of relationships. Over the years however, I’ve learnt that not everything we expect or look forward to in a relationship comes as part of it, there are some things we have to work on and earn or just be patient about, especially when it has to do with the other person’ space or privacy. If you are having issue about phone or social media access in your relationship, you have to ask yourself, is it that you do not trust your other half or is it something you just feel you’re entitled to as part of the relationship of expectation? If it is a question of trust, talk about why you’re struggling to trust your partner. Do not feel guilty about being called ‘insecure’ if your partner’s behavioural patterns are causing you to question trust in your relationship – such as not opening their messages when they are next to you, or if they are not comfortable leaving their phone around. . I’ve always said trust is not an entitlement, it’s something you earn. Rather than playing detective and piecing together clues on your partner’s phone, have an open conversation with your partner about it and make your decision based on the outcome of your conversation. Do I think partners should share their phone passcode with each other? Absolutely! I feel openness in every aspect is vital to the growth of every relationship especially marital relationships. I appreciate the need to both partners to have their respective spaces but not at the expense of making your other half feel like you’re hiding something from them, therefore making them feel insecure. That said, if your partner trusts you with their details, it is equally important to respect their space. I dated my wife for about 5 years and within that period we have grown comfortable to respect each other’s space. I wouldn’t go into her girls group chat, and if I did, I know it’s at my own peril, same goes for her. This way the relationship doesn’t feel like a prison sentence where one party feels they are being monitored. If your partner is not sharing their details, pestering is not the way forward. It just makes you look insecure. Focus on building friendship within the relationship; good communication, openness and trust would follow. At least that was what I found in my situation. How have you tackled the issue of phone, email or social media password in your present or past relationship? I would love to hear your thoughts – comment below or anonymously leave a message in the contact us page.